Af ter mentioning in a post that I was making a trip to the library, a couple of people wrote to say how much they loved going to the library. One lucky lady said hers was right down the street, which made me think of a time when I was young that we lived right down the street from our library. We weren’t there very long, but I remember a heavenly summer where I read from dawn to dusk, every day, every minute I could spare. At least that’s the way I recall that summer. The library had printed up sheets of “bookworms”, each with a space for 20 stickers, one sticker for each book we read that summer. I think some of the kids were doing it as an assignment, but I was doing it for the sheer pleasure. The equivalent for me of giving a heroin addict all he can use and rewarding him for shooting up! And I got extra credit in school! I forget how many bookworms I filled up that summer, but it was a lot. For me that will always be the “summer of the library”. First I read all the horse books, then I went through all the scifi and then I started on the mysteries. Granted it was a smallish library, but I soon graduated to the big time – the main library downtown. This one was a bus ride away, but I was a very mature and responsible 11 year old, so I was permitted to make the trip on my own. The regular driver and I got to be good friends, and he kept an eye on me. There was the added bonus, when taking this trip, of being able to visit my mom at her office. I’d stick my head in the door, and if she was busy, I’d duck out and go home. If she had a few minutes, I’d go in and visit and look around. It never crossed my mind that I, like my mother, would spend my working life in an office. I was going to be a doctor, or a detective, or a stewardess on a big plane. Funny, isn’t it, how very differently your life can turn out from what you’re expecting? 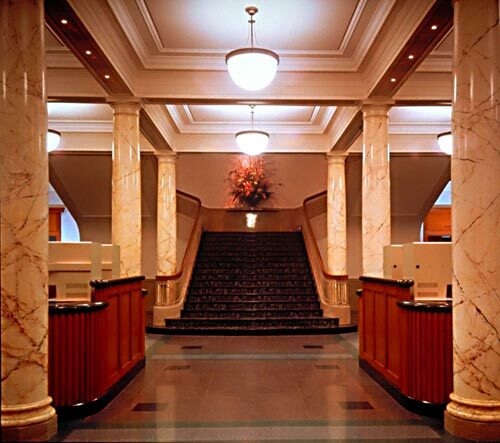 Now I’m here in Oregon, and I can take advantage of the Central Library in downtown Portland. 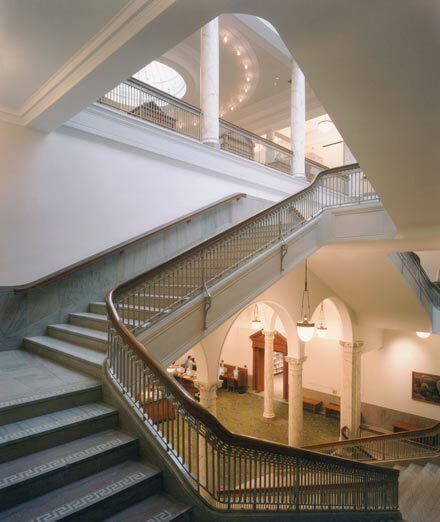 The picture above is of the grand staircase, which was restored, along with the rest of this beautiful building, in 1993. It was designed by A. E. Doyle and built in 1913. The picture to the right was taken after the building was brought back to its former glory. If that wasn’t enough, an eco-roof was recently installed and had already helped to reduce heating and cooling costs. Could you call it a building with beauty and brains? In any event, should you find yourself in our fair city, you should pay this lovely library a visit. You’ll be glad you did. Categories: Books, Library, writing | Permalink. I don’t remember how old I was when my mother told me that Mama’s ring would be mine someday. Mother had beautiful hands, and the ring just fit her slender ring finger, as it had just fit my grandmother’s in an earlier day. Now arthritis had thickened her hands and the ring no longer fit. My mother would let me try it on from time to time, and at first it was too big for my small hand, and would slide right off my finger. But as the years went on, my hands grew larger until the ring was, for me as well, a perfect fit. The ring would pass from Mama, to my mother, to me, and one day to my daughter. It was the idea of the continuity of the tradition that pleased me, as well as the thought of becoming the custodian of the physical ring, the knowledge that I would be wearing a diamond ring, a thing of intrinsic value, as well as a heritage, to be worn proudly and guarded well. It made me feel, at fourteen, that I was becoming a woman, that in addition to the ring, I was being given a new level of trust, and it made me yearn for the secrets that adulthood and maturity would convey. I was ever in a hurry to be a grownup. And at last the day came! Somewhere Back East, in a box in a friend’s garage, there is a picture of me that was taken that day. I look as impossibly young and innocent as I was, on the day I got my ring. My mother had a jeweler clean and place it in a jewelry box. Even though I knew full well what that tiny box contained, I can still remember how fast my pulse was racing when I opened it, and there was my heart’s desire, placed into my very hands. I put it on and for the most part, didn’t take it off again for many years, until it was time for me to pass it on. I realize I haven’t described this small but important piece of jewelry, so beautiful in my eyes. It was a quarter carat blue white diamond, in a Tiffany setting, and with the recent cleaning it blazed in the sun. The stone, though not large, was beautifully cut and possessed many tiny reflective surfaces. 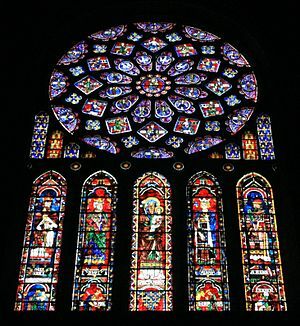 I must confess there were many, many times as I knelt devoutly in prayer, my eyes cast down, I was making tiny little hand movements that charted reflections from the stained glass windows, or made the miniscule candle flames dance in flickering rows. Guilty but exhilarated, I concentrated on these visions as the organ music swelled and voices rose around me in song. I see it now as another form of worship; the colors and the music and the light, echoing the words and the incense of the service. All part of a spiritual experience I was just beginning to comprehend. Now back to the present day, and the tradition will go on, but it will take a different path than I had thought. My only, and quite satisfactory, child is a son. I never had a daughter of my own, but my next-younger sister had a lovely daughter, who is now expecting her first child, a little girl. So the ring will go on, from me to my niece, and now to her daughter. I’m sure that Mama and my mother will be watching when the little ceremony takes place, and they will smile. Categories: heirloom, tradition, writing | Tags: Diamond, Stained glass | Permalink.